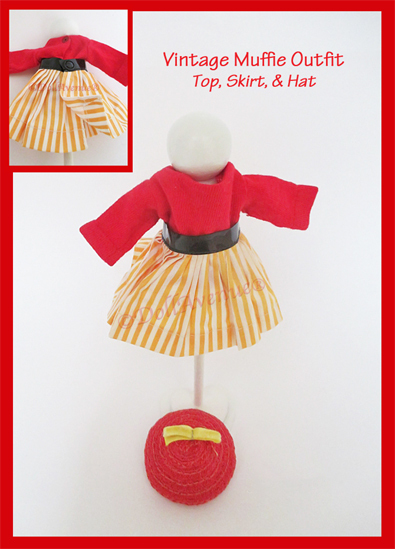 Cute vintage outfit for Muffie or similar sized doll. The outfit consists of a yellow and white striped skirt with black patent self-belt that snaps in the back. The skirt is untagged as many of Muffie's clothes were, but has distinctive hallmarks that point to Nancy Ann's Muffie including the skirt seam cut at a diagonal slant and the attached belt. Paired with this skirt are a red knit top that snaps in the back with an unfinished bottom hem, and a darling red straw hat with yellow bow. Unsure if these were part of the skirt set or just a good match for the skirt. All three pieces are in clean, excellent condition.